Rhode Island State Police report two men from Hyde Park died in a crash that injured two other Hyde Park men on I-95 north in Warwick around 4 a.m. on Sunday. Watch out for those concrete blocks! 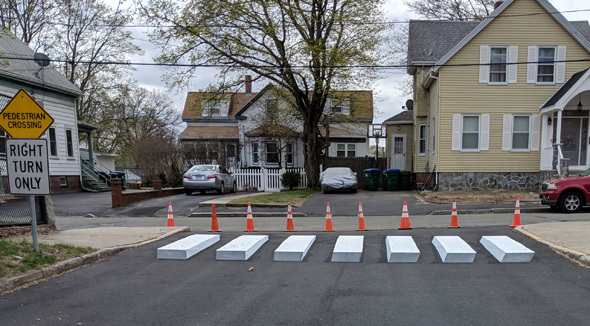 Artist Nate Swain finished up a project at the Brooks School in Medford today that might help motorists remember to actually stop when driving out onto Allston Street: An illusion that makes drivers think they're about to hit large concrete blocks: Read more. An Avon man who showed a gun to another motorist as they hurtled down the outbound Expressway this morning now faces a variety of charges, State Police say - adding they are still considering whether to charge the other driver, a Boston man, because they say he flashed a knife during the rolling incident. Read more. 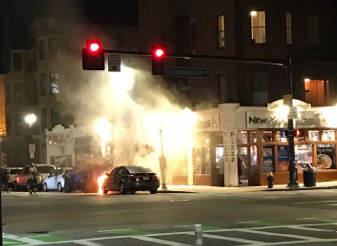 Ryan Hatcher was across the intersection from New York Pizza tonight when a car parked on Columbus Avenue burst into flames. He reports: Read more. 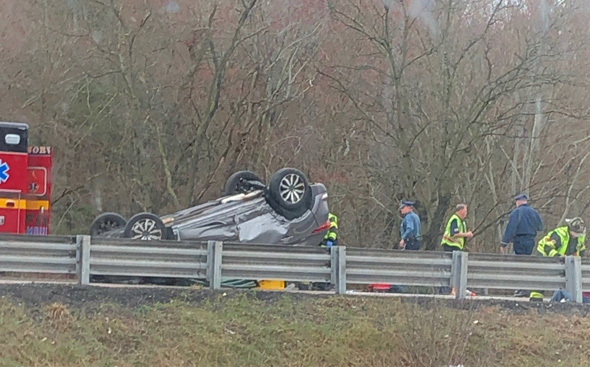 Kim C. spotted the aftermath of a bad crash on I-95 north in Canton this morning. 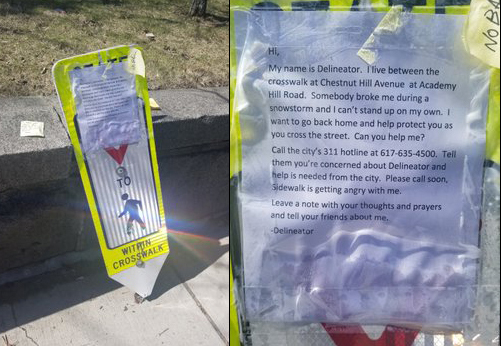 Marshall Hansberry shows us the plaintive plea posted on a knocked-over crosswalk delineator on Chestnut Hill Avenue at Academy Hill Road in Brighton. 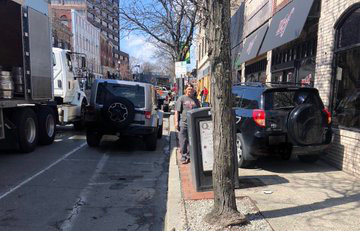 The mayor's office announced that come July 1, the cheapest parking meters in the city will set you back $2 an hour - up from the current $1.25 - as part of a bid to reduce street congestion and raise money for road infrastructure projects. Read more. A South Boston resident posts a photo of the note he found on his windshield this morning - a morning, it might be noted, with not even a speck of snow on the ground. Draw Bridge between Science Museum and State Police Barracks on Charles Dam Road in #Boston stuck in slightly upward position. Road impassable in both directions. 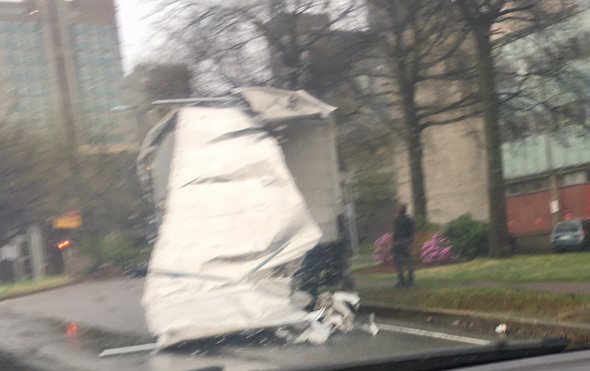 Expect major traffic delays, avoid area if possible. 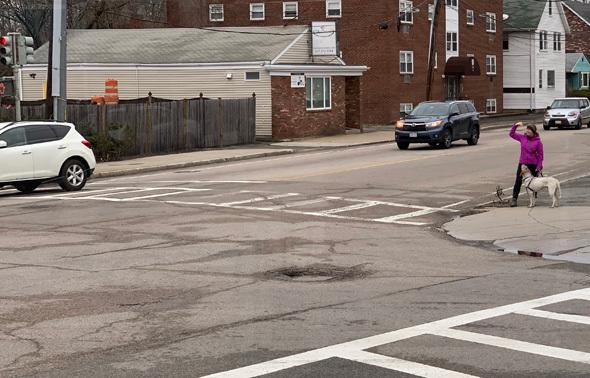 Quincy Police report today on an encounter with a Masshole: Read more. 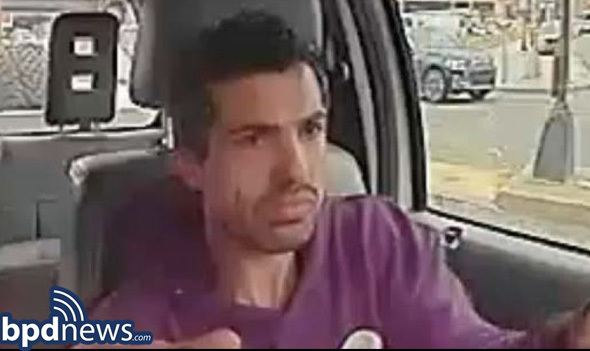 Boston Police have released a photo of the guy they're looking for some mayhem on Northern Avenue Friday morning that made all the evening news broadcasts thanks to the surfeit of reporters and camera people already in the area for the arraignments at the Moakley Courthouse in the college-admissions araignments. Read more. 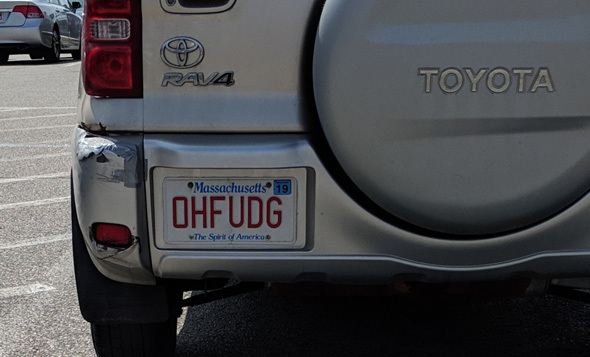 Spotted the other day at the Walpole Mall. State Police report charging both women in that Rte. 128 incident on Friday that made the national news. Read more.